Philippines' Permanent Representative to the United Nations Teodoro Locsin Jr.
MANILA, Philippines (3rd update, 12:06 p.m.) — Philippine Ambassador to the United Nations Teodoro Locsin Jr. submitted on Friday (Manila time) the Philippines' letter of withdrawal from the Rome Statute of the International Criminal Court. 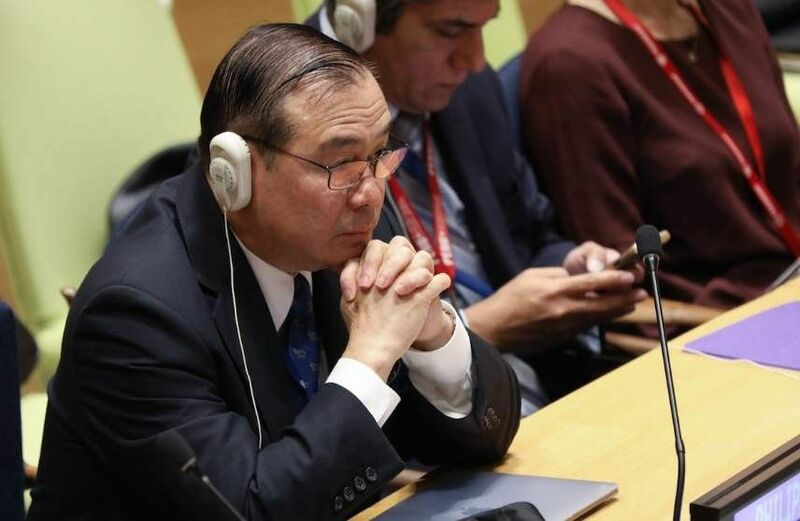 In a Twitter post on Friday, Locsin said that the letter was delivered to UN Chef de Cabinet Maria Luiza Ribeiro Viotti, a representative to Secretary General Antonio Guterres who is currently in Cyprus. In its letter dated March 15, the Philippines said that its decision to withdraw from the treaty that establised the ICC was a "principled stand against those who politicize and weaponize human rights." "The Philippines assures the community of nations that the Philippine Government continues to be guided by the rule of law embodied in its Constitution, which also enshrines the country's long-standing tradition of upholding human rights," the letter read. The letter was delivered days after President Rodrigo Duterte announced his decision to withdraw from the ICC. He is accused before the international court of crimes against humanity for leading and instigating killings of thousands of drug suspects in his war on drugs. On Thursday, his spokesperson, Harry Roque, aired Duterte's theory that there is an international conspiracy against him despite having said months ago that he would face the accusations and even defend himself before the international tribunal. In its letter to the UN secretary general on Friday, the Philippine government claimed that it would continue to fight against impunity for atrocity despite its withdrawal from the Rome Statute. "The Government remains resolute in effecting its principal responsibility to ensure the long-term safety of the nation in order to promote inclusive national development and secure a decent and dignified life for all," the Philippine Mission to the UN said. Under Article 127 of the Rome Statute, a state party may withdraw from the treaty through a written notification addressed to the UN secretary-general. The withdrawal will take effect a year after the date of receipt of the notification. Foreign Affairs Secretary claimed that the campaign against Duterte and the Philippines is misleading the international community through distorting the human rights situation in the country. "It is doubly lamentable that members of the international community, who include our own partners in the war against terror, have allowed themselves to be used as pawns by these individuals and organizations in undermining our own efforts to restore the rule of law," Cayetano said in a statement, explaining Manila's withdrawal from the Rome Statute. The Philippines' top diplomat insisted that there is no crime or liability linked to the Duterte administration's campaign against drugs is a legitimate law operation. Manila has always been firm on its position that States have the inherent responsibility to implement measures consistent with their respective law. Citing this, Cayetano said Duterte had identified the proliferation of illegal drugs as a serious threat to the Filipino people. "The campaign we are waging against illegal drugs is consistent with the sovereign duty of any State to protect its people," Cayetano said. "Contrary to what some parties are trying to make it appear, there is no failure on the part of the Philippine Government in dealing with issues, problems, and concerns arising from this campaign. These are dealt with by independent and well-functioning organs and agencies of our State," he added.